Our first dance of the year will have great music by the Powerhouse Band and calling by David Kaynor, and some exciting and unusual events before the dance. The Power House Band is an impressive family band (plus friends) led by young Kate Powers. They take the music and the dancing to a new level. David Kaynor's bio is interesting and extensive. He began playing fiddle in 1974. 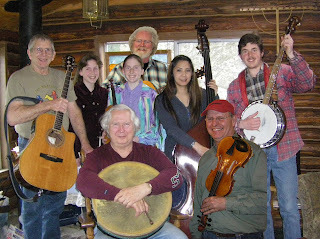 His deep love of this instrument led him into many situations including country-rock bar bands, string bands, and contra dance bands around the Connecticut River Valley and elsewhere. Soon, it led him into teaching, and he's thought of himself as a teacher more than as a performer ever since. He began calling contra dances in 1980, taking over a little dance at the Guiding Star Grange Hall in Greenfield, Massachusetts which then struggled along for three years before becoming the first really established public dance there in decades. He has also called and/or played at numerous small, out-of-the-way dances and other events around New England. 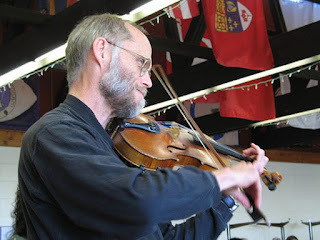 Before the dance, also on Saturday, 9/5, David will be teaching calling and fiddling. There will be a Pot Luck 5:30 -7PM for everyone to reconnect and get ready for a great dance and a great year. The into class begins at 7:30, like usual, and our dance will begin at 8. Please join us. Looking forward to a great year. All other dance details are on the "About Our Dance" page on this website.